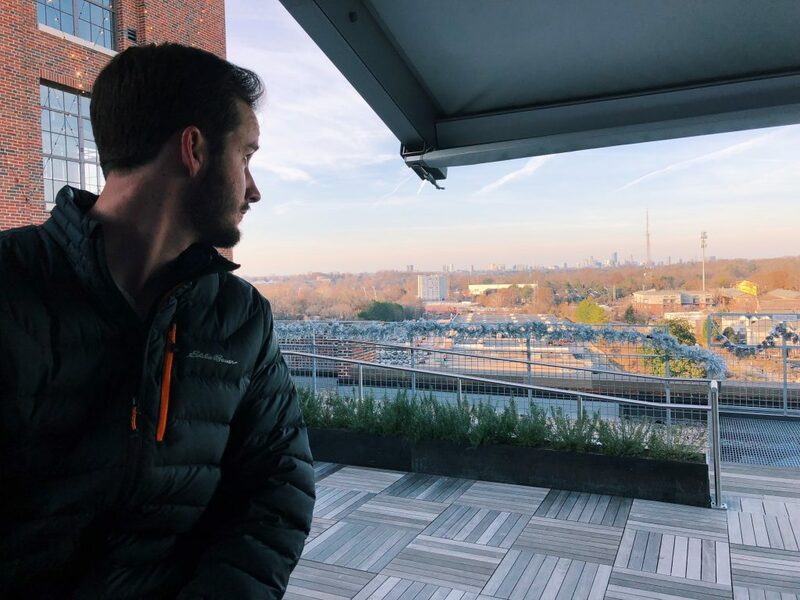 Atlanta is a beautiful city full of so many fun things to do and see and some amazing food. I had never been there (other than the 1996 Olympics when I was two years old) and now I’ve visited four times since July! I absolutely love it, and always have the best time researching and exploring new things to do while I’m there! 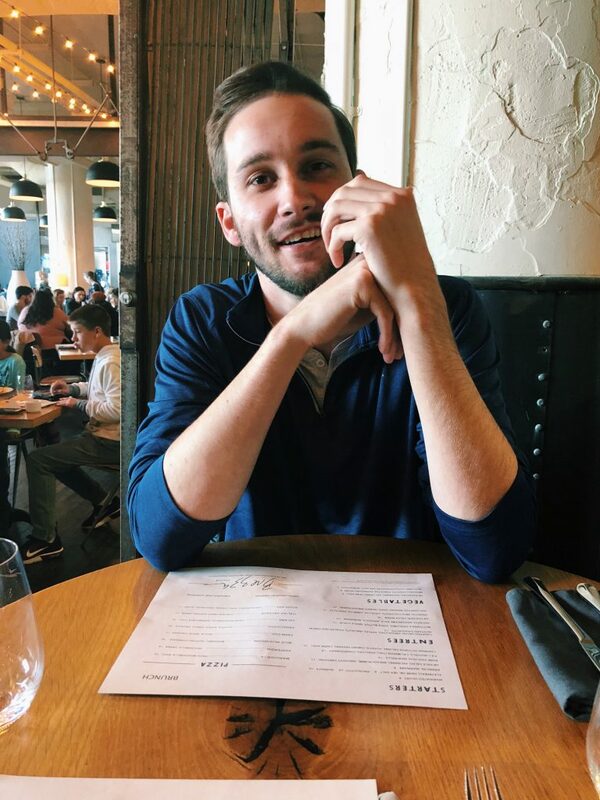 BUT if it’s your first time visiting, or your twelfth, there’s one place that is my must-do one stop shop for food, shopping, and activities – Ponce City Market. 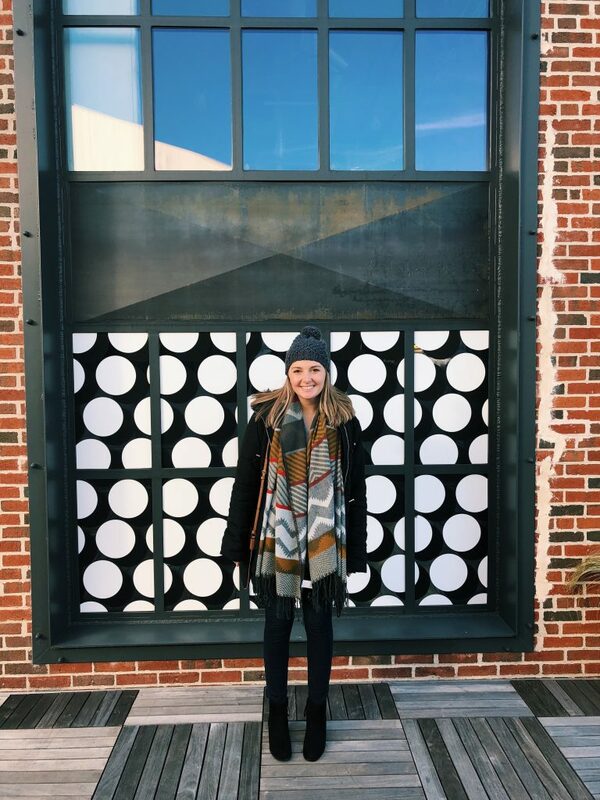 I’ve talked about Ponce City Market in a previous post, and the trouble that we had finding it our first time visiting (think following my phone maps on a 2 hour walk through residential Atlanta), but today I’m going to share some of my favorite spots there that you need to try and the totally unique can’t miss winter activity they have! This place is so interesting because of its history as well as it’s never-ending list of activities. 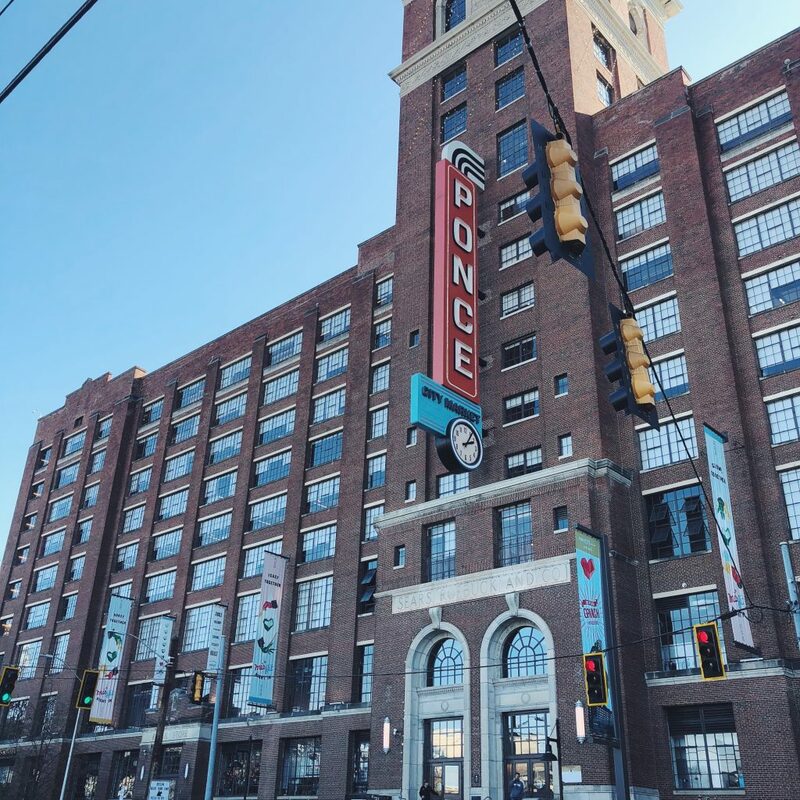 Ponce City Market is in an old Sears, Roebuck & Company building, which at one point was the largest Sears retail and distribution center in the country! 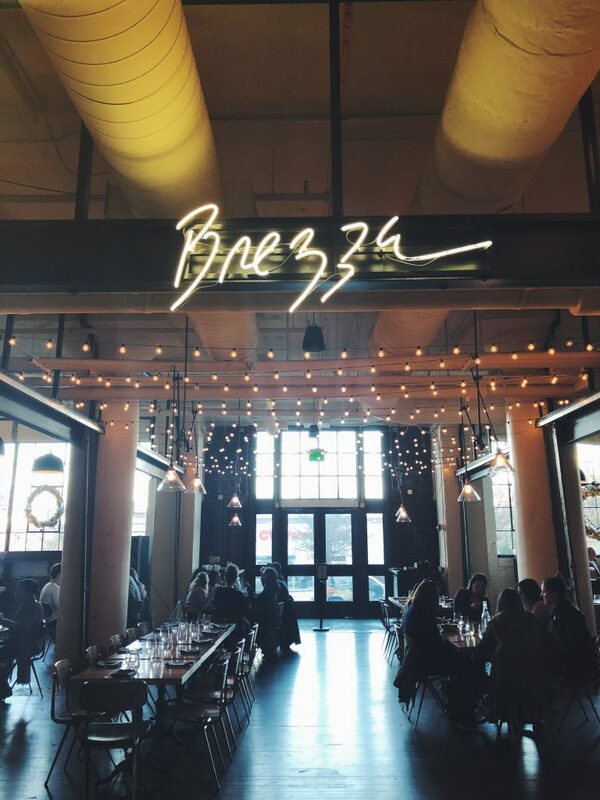 In 2014 it opened as Ponce City Market and has been a city favorite ever since! So keep reading to see my favorite spot in Atlanta and what they have to offer! The one thing that Ponce is not lacking in is food. 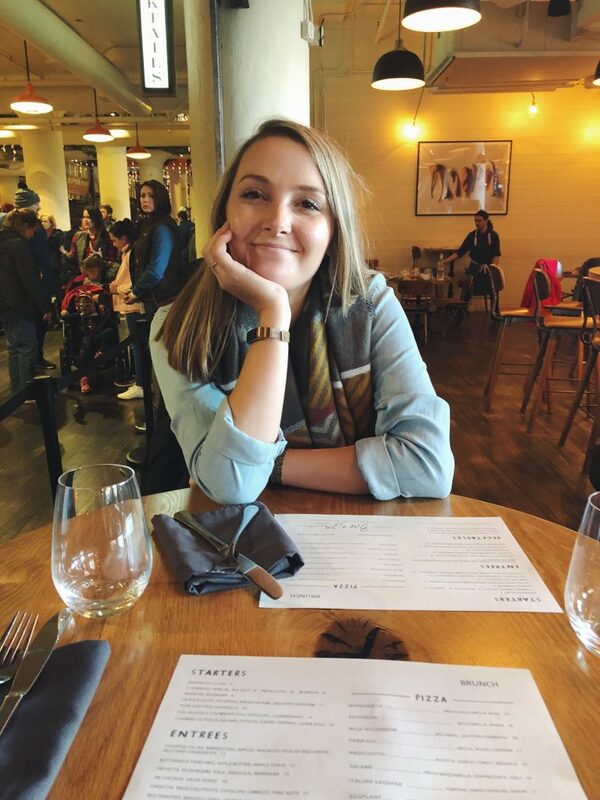 They currently have 29 food and drink stalls and restaurants all over the property that offer everything from pizza to fried chicken to Asian noodles to Mexican sandwiches and lotsss of gourmet coffee. 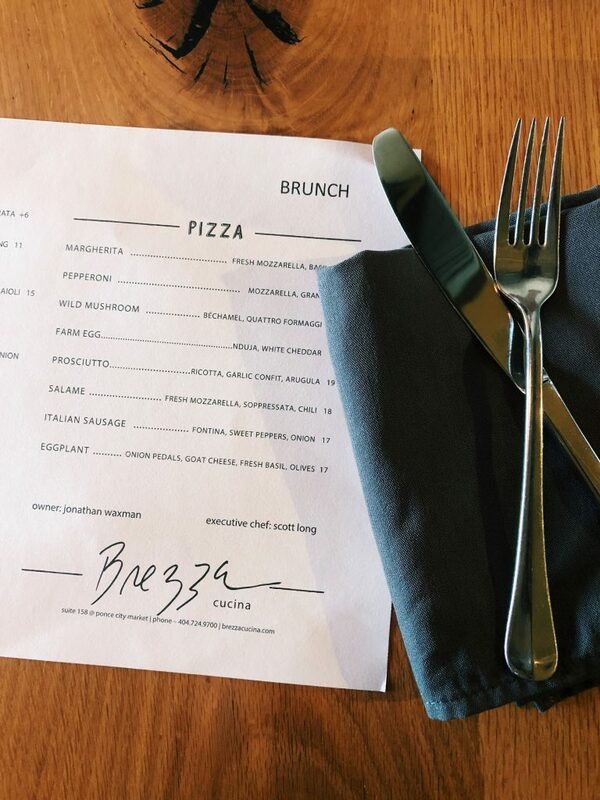 I’ve tried to try something new every time I’ve been, and most recently we went to Brezza Cucina for lunch and LOVED it! 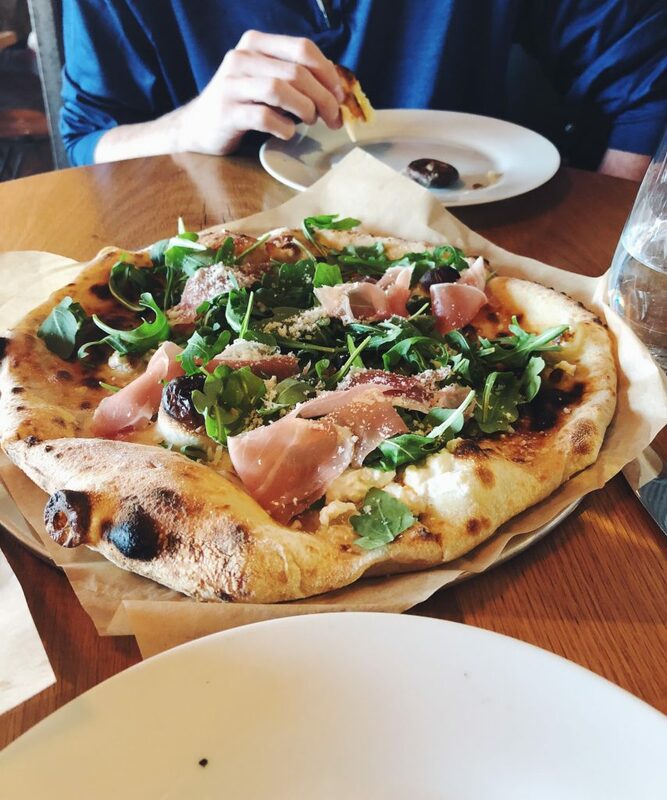 We ordered two gourmet pizzas to try: prosciutto and portobello mushroom, and they were incredible. We’ve also had Hop’s Fried Chicken, sandwiches from El Super Pan, and a poke bowl from W.H. Stiles Fish Camp. Ponce isn’t all about the food, though. They’ve also got SO much to do! 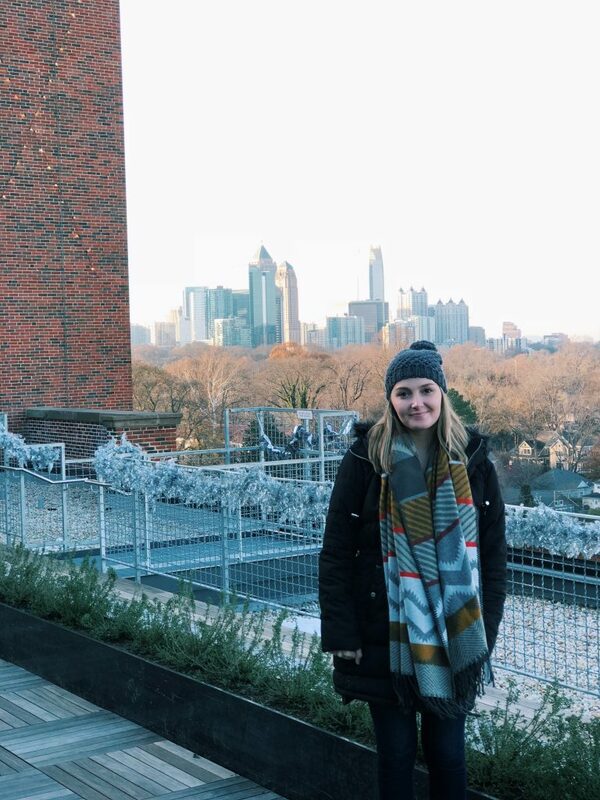 Most recently, I got to visit Skyline Park, which is on the rooftop of Ponce City Market and gives you an amazing view of the city. During the winter months, Skyline Park opens up Skate the Sky, where they have an ice-skating rink on the rooftop, in addition to all of the other fun things they already have. 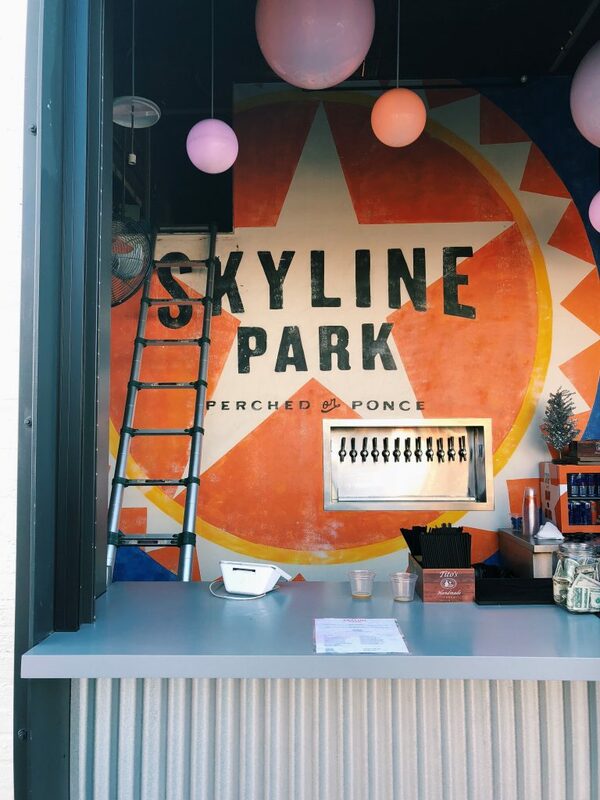 A few of the things that you can do at Skyline Park – putt putt golf, midway style games, a beer garden, fair-style concessions, and more! 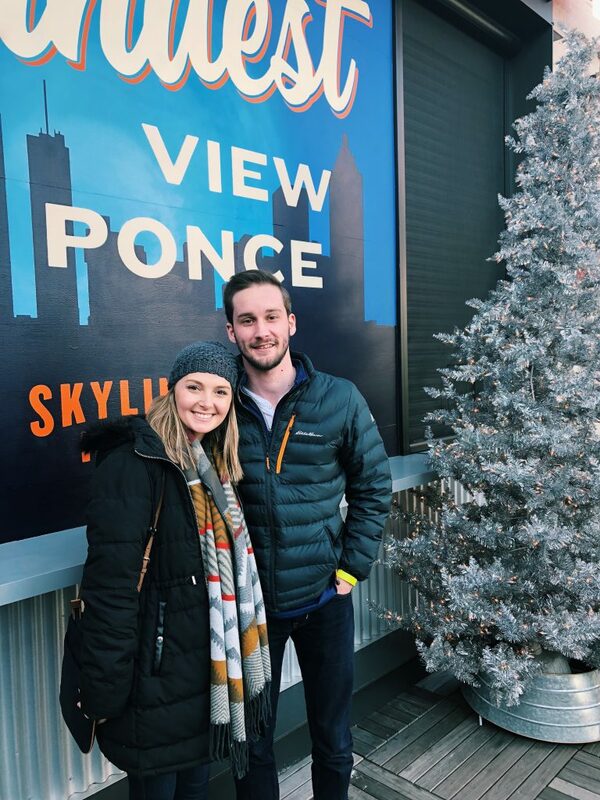 We had so much fun exploring the rooftop and can’t wait to go back when it’s just a little warmer so we can enjoy it even more! 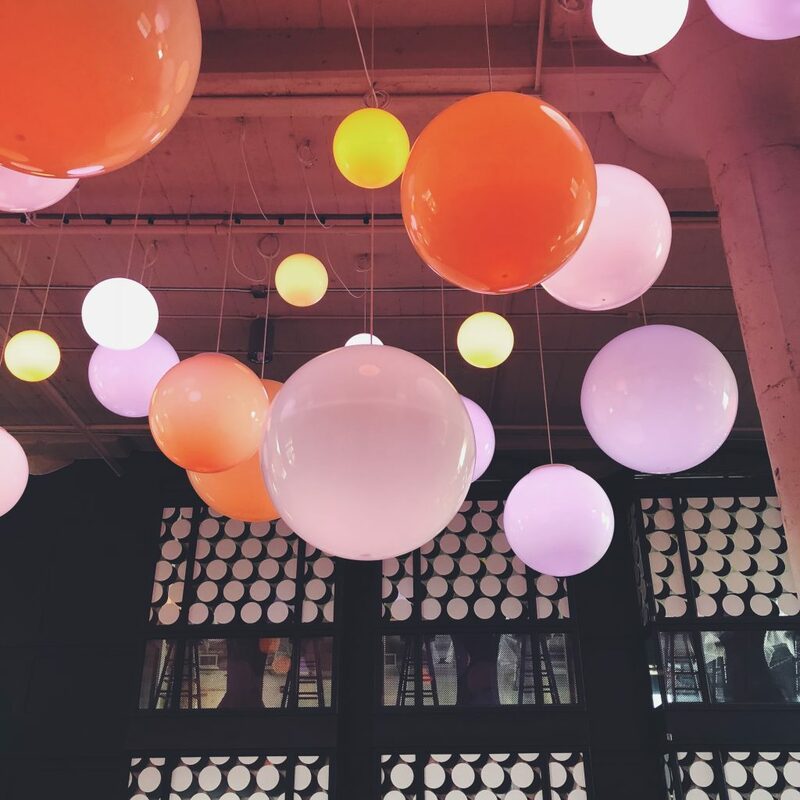 Ponce City Market also houses Atlanta City Winery, bike rentals, a yoga studio, office spaces, and even more. AND the Beltline, which isn’t exclusively for Ponce, but runs right next to the building! Kenny and I left Ponce and walked the Beltline for a few hours, popping into fun stores and taking pictures at the murals along the way! Paris on Ponce is a unique flea market/event space that we really enjoyed, and there’s so much more that we weren’t able to see! 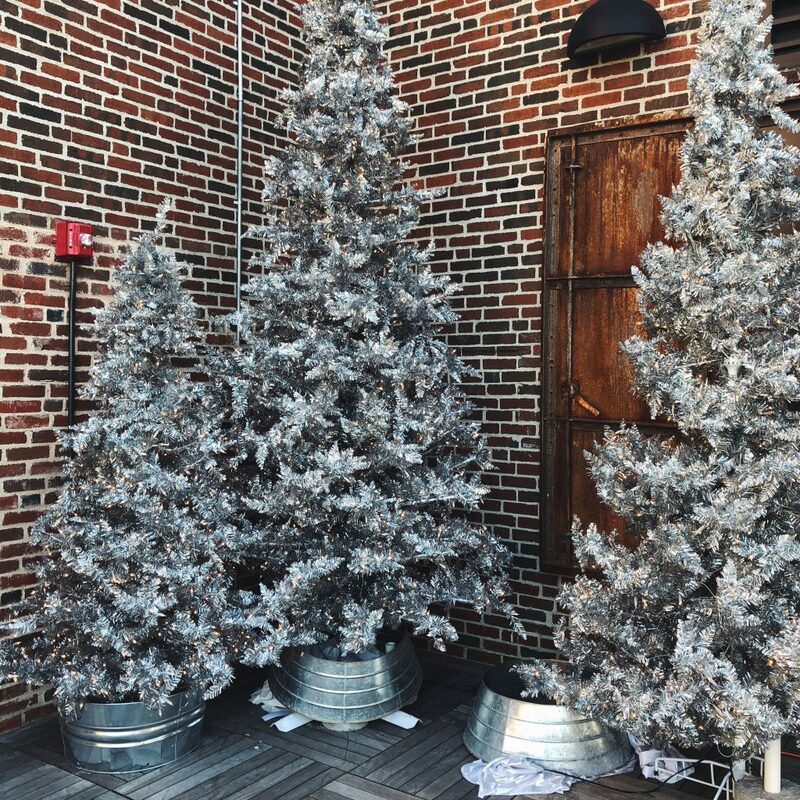 Lastly, the shopping at Ponce City Market isn’t something that you wanna miss! 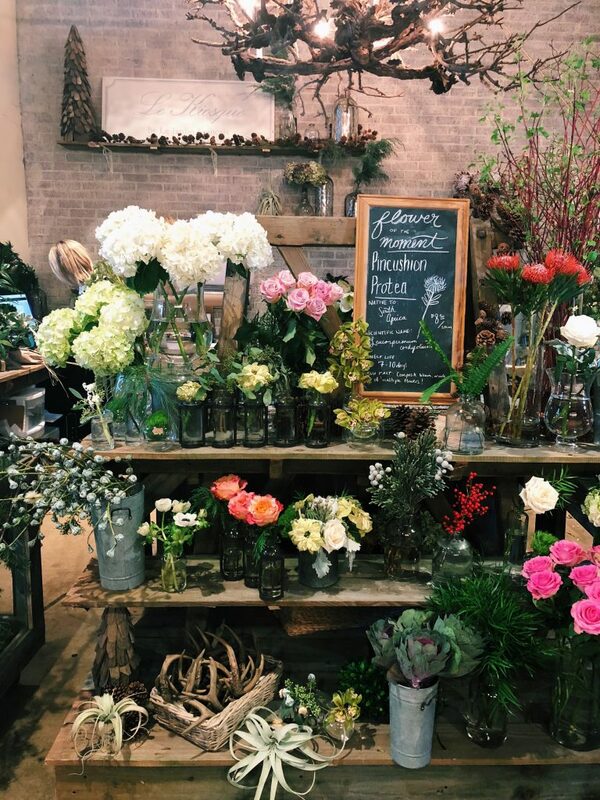 West Elm and Williams Sonoma are the two anchor stores on the building, but walk out back and you can spend the rest of your day shopping through chain stores like Anthropologie and Madewell, or lesser known stores like the independent bookstore Posman Books (a personal favorite!). There’s tons of options for all sorts of budgets and styles! 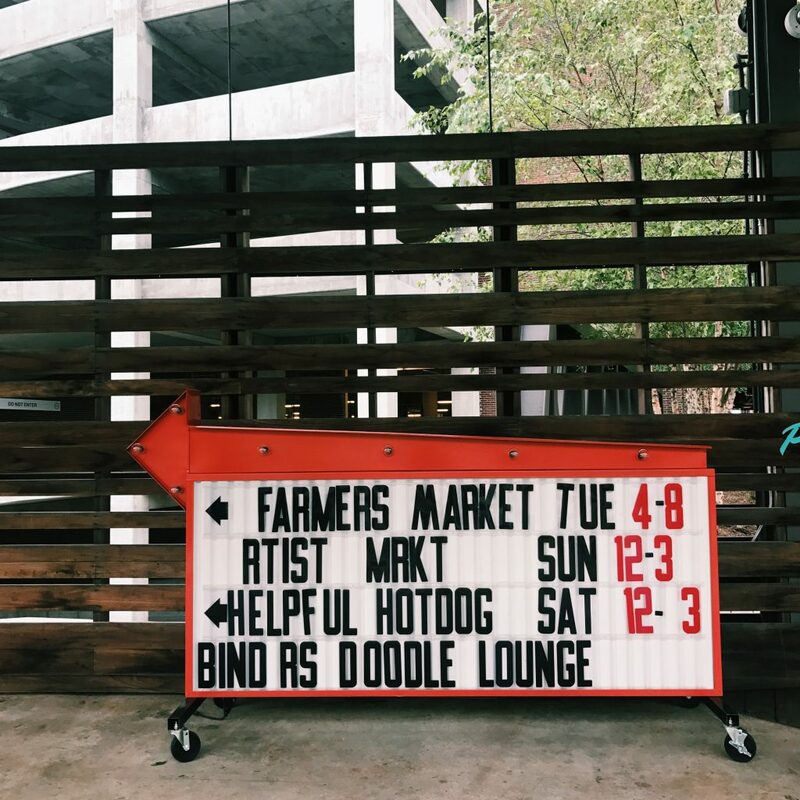 It’s almost impossible to run out of things to do at Ponce City Market, and I’ve barely scratched the surface on sharing these things with you! Next time you’re in Atlanta, stop by and see all there is to experience here. I promise, you won’t be disappointed!